More years ago than I care to remember I was seized by the impulse to buy a pair of roller boots. Inline skates were just emerging as the new big thing, but I wasn’t impressed – I wanted something more retro, a bit more rock and roll. I took a friend who knew about these things and headed to a skate shop in Camden. I came out clutching a huge box housing a pair of Bauer quads – not unlike those in the pic, except mine were completely black with purple wheels. Not long after that I had reason to make a speedy exit from my little bedsit in Wood Green. Not content with making me live in some sort of menagerie, the owners had obviously taken exception to me setting fire to my kitchen(ette) and tried to demand rent that I didn’t owe. They even threatened to phone my mother, prompting me to use the kind of language that they had been hitherto unaware I was capable of emitting – fires aside, I had been a model tenant. My sudden evacuation turned out to be a good thing. For one thing it precipitated a move to the other side of the North Circular to the almost leafy area of Palmers Green. House sharing with my social animal of a friend meant that I basically lived alone throughout the week, meeting him at the weekends and tagging along to whatever activities he had planned – life was easy. Then he went travelling, and I didn’t. I really should have gone with him, although he’d have spent the whole time persuading me to stand up and move, rather than sit down and do nothing. Instead I spent a brief sojourn living 180 degrees around the capital. Just off the south circ, in what is generously called Clapham South, but is more honestly Balham North, I decided to get my (practically untouched) skates out. Did I mention that I was living off the South Circular? As I rocketed down the path, I noted that a) the bearing on my skates were fabulous – the wheels spinned faster than I remembered my childhood roller skates moving and b) I had no idea how to stop…..
My dreams of skating carelessly around the common stopped abruptly at the point that I made a grab for the lamppost. Bugger rock hard thigh muscles, I choose life…. Not long after that, I exited Balham and followed my much more adventurous friend on his travels. As predicted, my tendency to sit still for long periods of time meant that we crossed over rather than tandemed, which worked pretty well – apart from the time that he tried to call international rescue after I didn’t turn up in Lake Toba. In my defence I was loving the Perhentian Islands, and suffering from Giardia – long journeys were not to be attempted. I never did learn to skate, not in those skates anyway. I in-lined around Centennial Park, Sydney many times and quite took to the whole in-line thing, but my poor old Bauers remained untouched. I still have them, and whenever they get unearthed I refuse to throw them away. There must be some deep seated reason there somewhere…..I’m obviously still hankering after those elongated thigh muscles. I love it when we get to learn a bit more of our favourite bloggers’ back stories. I can picture you waltzing your way around London, the globe and the skate park in Sydney but the South Circular?? Death wish woman. No wonder they never got another outing. Where I grew up Bauer Ice Skates were THE thing as we had a new (er, this was about 1983) ice rink in our town where all the cool kids chose to hang out until they were old enough to move onto the nightclub across the road. I never had a pair and just the sight of that lettering has unleashed my unrequited love. Maybe you should get them out again? I too had a brief aquaintance with a pair of in-line skates. Mainly along Brighton sea front, when we first moved here, you know, just to keep up with the kids! And as much as I tried I could never, ever turn left! But I did learn to stop, sort of, well that is what lamp posts, benches and children are for…right? Knew you had a calling after all. Get your skates on lassie, I need you to prod me in the backside when I am flailing. Will catch you if you fall, promise. I just may be a tad *ahem* sweaty. There must be one of those cupboards in every house. The one full of stuff bought with good intentions but only makes it out of the box twice. Soda Streams, Bread makers, Steamers in the Kitchen cupboard and a cross trainer and a gazebo in the shed just to name a couple in our house. My sister bought some rollerboots when i was a kid, and i was sooo jealous. I still dream about roller discos. There’s something so damn cool about it all. oh, and interestingly, i grew up in balham. 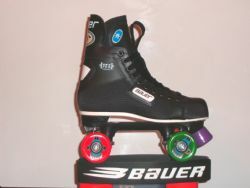 I used to love my roller boots back in the days when roller discos were still cool (nothing as fancy as Bauer though – tenner at Argos I think!) . Still remember the best flippy move ever that caused my friend Alison to split her jeans when she attempted it. Funny the things you remember isn’t it! Your cupboard sounds fab!! Can I come and raid it sometime? Apart from the steamer that is – FFS, they’re a waste of time aren’t they?! Blimey!! What on earth was your friend Alison attempting there! Are you volunteering to video my pain? No doubt in order to stick it in a jiffy bag addressed to Mr Harry Hill esq…….the cheek! I always consider myself a great success if I don’t fall down on the ice when taking my daughter ice skating!